“Miami Beach is no longer fit for humans,” I say to my friend as we slog along Collins Avenue towards Ocean Drive in search of a cooling breeze. It is 89 degrees out, but my phone app says it feels like 101 degrees. This seems accurate. Don’t get me wrong. I love Miami and Miami Beach. I did my graduate studies at the University of Miami, worked in Coconut Grove for a foundation addressing sustainable livelihoods in the Americas, and lived very happily in Coral Gables for many years. But even in the relatively short time I’ve lived away from Miami (roughly 15 years), the summer heat is already more noticeably oppressive. Local and national tracking data confirm that storms and related flooding, king tides (tidal flooding events occurring even on sunny days), and beach erosion have been on the uptick. 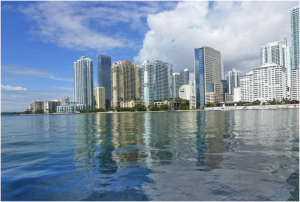 In a place that is at sea level and built on a swamp, future sea level in Miami is expected to rise anywhere between 6 and 10 inches by 2030. Filled to the brim with the steady stream of announcements about how the current Administration will go about creating “American energy dominance,” through the rollback of existing climate and environmental policies, I had landed in Miami Beach the day before to attend an event designed to garner support for emerging documentary films from across the Americas. Of the beautiful films featured at the event, two spoke directly to the complexities of resource extraction, sustainable ownership and management of natural resources, and the impact of economics and politics on the ability of vulnerable communities to pursue healthy lives. All of these issues are intricately connected to the man-made impacts of climate change. A third film touched indirectly on these issues. It explored corruption and accountability in a Central American region that has spent centuries dealing with the consequences of racism and oppression, driven by natural resource extraction-fueled greed. Who is working to thwart disaster? As I watch trailers and hear filmmakers and protagonists talk about their work and why they are compelled to act, I reflect on the fact that we are barely a month out from the Trump Administration’s withdrawal from the Paris Agreement. There has been shock and outrage from those concerned about the realities of our warming planet. There has also been a strong sentiment of support from folks around the world who are nonetheless committed to making sure our planet does not become completely uninhabitable for coming generations. These films, like so many conservation, renewable energy, smart building, and policy reform efforts, reflect the work of many people who understand that both offense and defense are needed to move us towards any form of livable future. While in town, I learn that the city of Miami Beach and other low lying areas have been undertaking a costly plan to raise streets in flood prone areas, and prepare drainage and sewage systems for the increased pressure from more frequent or severe flooding events. With a little digging I also learned that, like in any region, low income people are most negatively impacted by changes in the local climate. In regions outside of the media spotlight of Miami Beach, Key West, or Mar-a-Lago, flooding and intense storms happen with little attention. Few resources for raising awareness or advocating for preparedness are available to make sure that luxury coastal zones aren’t the only areas resilient enough to thrive in the coming decades. There is nothing new in this inequity, either here in the US or around the world. But there is hope that folks are taking note and doing something about the fact that we simply can’t “save” some places from ecological disaster and assume that this will trickle down to more vulnerable or less visible locations. As I was leaving Miami, mayors from cities all over the US were arriving for the meeting of the Conference of Mayors. At this gathering, the Conference approved resolutions to urge the federal government to rejoin the Paris Climate Agreement and to redouble their own efforts to tackle climate change and spur renewable energy. Many of these leaders are also members of the Global Covenant of Mayors for Climate & Energy, an international alliance of local governments addressing the urgency of climate change. Again, multiple sectors outside of the federal government are doing what they can (and should) to fulfill our commitment to our planet. So can we confront climate change without the backing of the US President? Yes and no. Yes, there is much that we must do that is both right and in direct contradiction to the goals of the Trump Administration. But we’ve known this since November 9, 2016. We need to keep finding ways to stay organized, get people involved in caring about each other, and in not giving up in the face of many uphill battles. But, like stories of mayors from across the US and around the world stepping up to protect their towns and cities, we also need to keep in mind that we are not reinventing the wheel. In fact, when it comes to climate change, we cannot afford to spend time reinventing the wheel. In the US, it may look as though after years of apathy, the nation has rediscovered citizen engagement and the social contract. In marginalized communities, this has always been modus operandi. Resilience and resistance are part of the fiber of low income, immigrant, people of color, LGBTQI, feminist, human rights, and other justice-oriented communities. Communities of color and low income communities have been fighting environmental racism for decades: halting pipelines, closing down coal plants, reinvigorating urban farming, promoting better land and water use, and fostering/supporting climate change policy (at times in greater numbers than other communities). Just as we can’t pretend that we in philanthropy have the answers to the problems others face in their communities, we also cannot ignore the successes that they have seen and the lessons they learned from battling (and winning!) against holders of power and privilege. This is one of the guiding values of the Grassroots Climate Solutions Fund: to acknowledge, support, and elevate the wisdom and experience of climate justice activists around the world (regardless of how or even if they label their work the way we in philanthropy do). Our grantees fight vested political and corporate interests that deny climate change impact in communities from Honduras to Indonesia. They also design and thoughtfully scale climate change solutions, ranging from agroecology to renewables and the protection of carbon sinks. The leaders with whom we have the privilege to support are largely women, youth, and Indigenous Peoples. Business as usual is not an option in any sector, as underscored in a rather horrifying article “The Uninhabitable Earth” published in New York Magazine this week. And now, more than ever, we need to listen to what women, youth, and Indigenous Peoples have been telling us for years. You can learn more about their work on our webpage (hosted by fund member Thousand Currents) and on the websites of the other member partners: Grassroots International, Global Greengrants Fund, and the Urgent Action Fund for Women’s Human Rights. Miami may be hotter. DC policy makers may be blinded. But there is hope because there are solutions everywhere. Everyday people, all around the world, are making sure the climate justice movement leaves no one behind. Join us!